Remove tops of pepper and seeds. Slice pepper lengthwise once to create a pocket for the rice. Toast peppers in toaster oven or broiler until softened to preferred level. While peppers toast, sauté onion in olive oil until browned. Add cooked brown rice to the oil and onions and sauté until slightly browned. Remove peppers from toaster and place rice inside. Top with green salsa and enjoy! 244 members have added this recipe to their cookbook. I added some browned turkey and chipotle sauce to give the filling a little more flavor for my husband. They were yummy! These are great, and you can add just about anything you want to them. Personally, I like to add some black beans, onions, and mushrooms. Yum! If I am remembering correctly off the top of my head, rice is 4 points per cup and 1/2 tbsp of oil is 1 1/2 points , so if you round up it is 6 points per serving. 5 if you want to hide the 1/2 point. that recipe can't be 6 points. You dont count the zero point veggies. They are "free" in unlimited quantities (not all veggies..just the zero point ones and all of the above are) You only count per serving 1 c. brown rice and 1/2 T. olive oil. 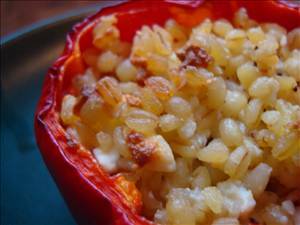 There are 378 calories in 1 serving of Mexican Rice Stuffed Peppers. Calorie break-down: 21% fat, 71% carbs, 9% protein.